The stars of the show would be Miss Ruth Honn of 815 West University Avenue, Mrs. Elizabeth Boggs Bartling of Chicago, the daughter of Judge and Mrs. F.S. Boggs of Urbana, and Frank “Roby” Robeson Jr. of Robeson’s Department Store on Church Street, Champaign. The film was directed by J. Law Siple of Siple Studios Inc. in Chicago and the cameramen were from the News-Gazette. The running time and exact locations of the shots in the film are unknown. It is also unknown if any copies of the movie survive. Local film groups have searched for the film but have come up empty handed. J. Law Siple also directed a film for Decatur titled “The City Beyond” just one month after the Champaign-Urbana film was completed. It also shot scenes at Chanute Air Base, but it is unknown if the films have similar plots. 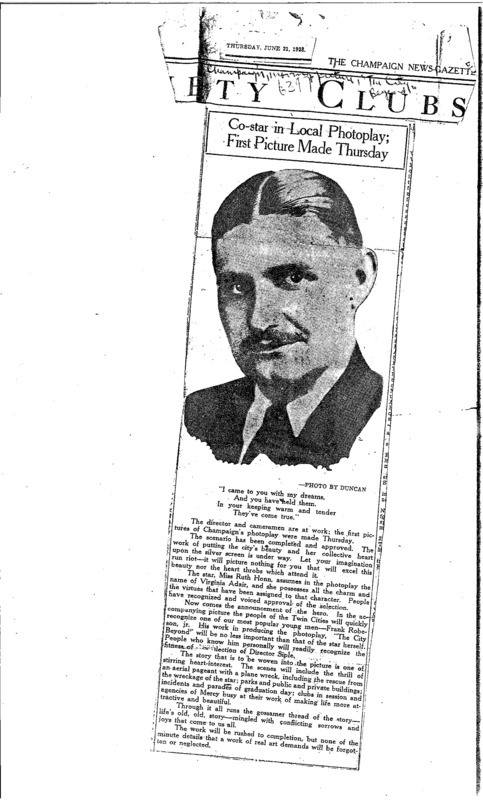 "Co-star in local Photoplay; First Picture Made Thursday": Newspaper article from the Champaign News-Gazette from Thursday June 21, 1923. Courtesy of the Champaign County Archives at the Urbana Free Library. 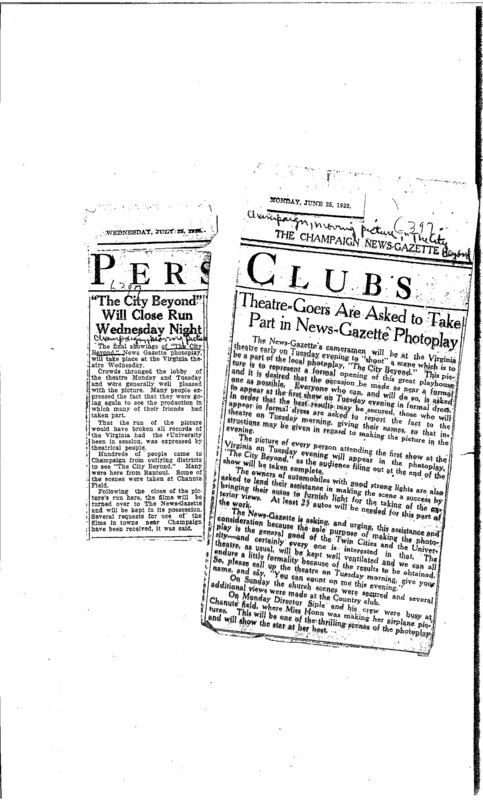 Newspaper Articles: News paper articles about The City Beyond movie featuring actress Elizabeth Boggs Bartling in the top article. The bottom article outlines that filming began at Chanute Air Base. Courtesy of the Champaign County Archives at the Urbana Free Library. 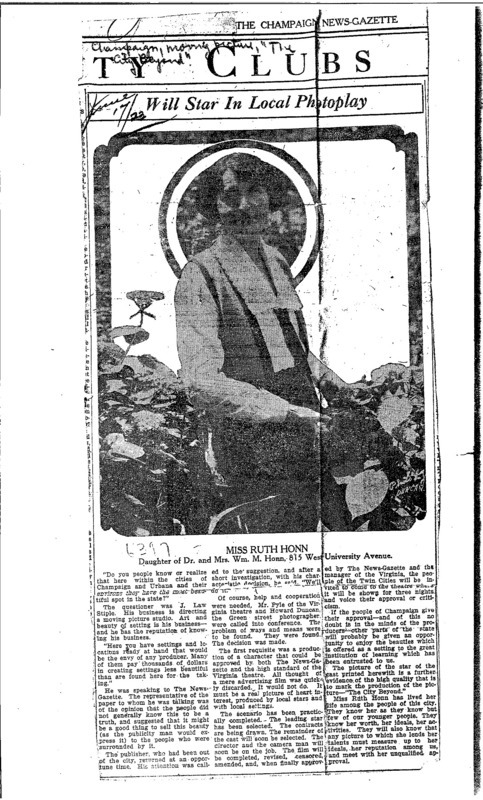 "Will Star in Local Photoplay": News paper article about the creation of The City Beyond and biography of Ruth Honn, actress in the film. Courtesy of the Champaign County Archives at the Urbana Free Library. 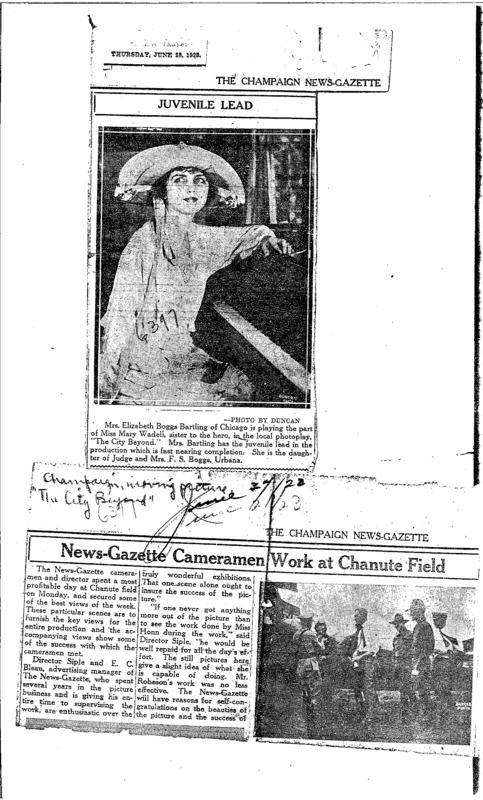 News Paper Articles: Champaign News-Gazette articles about The City Beyond film. Courtesy of the Champaign County Archives at the Urbana Free Library. 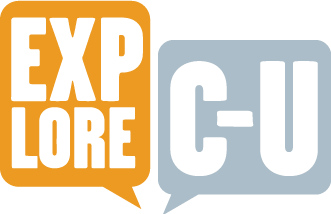 Kara Brehm, “The City Beyond: A News-Gazette and Virginia Theater Film,” ExploreCU, accessed April 21, 2019, https://explorecu.org/items/show/211. (1923, June 24). News-Gazette Cameramen Work at Chanute Field. Champaign News-Gazette. (1923, June 17). Will Star In Local Photoplay. Champaign News-Gazette. (1923, June 21). Co-Star in Local Photoplay; Picture made Thursday. Champaign News-Gazette. (1923, June 25). Theatre-Goers Are Asked To Take Part in News-Gazette Photoplay. Champaign News-Gazette. (1923, June 28). Juvenile Lead. Champaign News-Gazette. (1923, July 23). Great Crowds See Opening Show of Local Photoplay. Champaign News-Gazette. (1923, July 25). "The City Beyond" Will Close Run Wednesday Night. Champaign News-Gazette. (1923, August 31) Chanute After “The City Beyond.” The Decatur Daily Review.